Gold was discovered in the Barossa Valley, between Williamstown and Gawler in late 1868. At the peak of the ensuing gold rush 4,000 prospectors were at work at Spike Gully and Victoria Hill. The Gawler Times was founded by John Baptist Austin, who was later joined in a partnership by William Whaley, William Moffat and Alexander Ferguson. Whaley left the newspaper in 1870 and Austin in early 1872. Through most of its four years, the newspaper provided coverage of activities at the diggings and in the three small settlements associated with them. Correspondents from other towns and settlements as far away as Port Wakefield, Kadina and Tanunda also sent in news reports. As well as articles containing Adelaide news (under the heading 'Metropolis'), and interstate and overseas news, there was usually also a serial story. Local writer Maud Jean Franc's novel, Silken Cords and Iron Fetters, first appeared as a serial in the newspaper from 1869. Austin and Franc's families were long-time friends and her story was later published in book form by the newspaper. This was followed by a series of anonymously written, short 'South Australian Tales' from July 1870. Gawler already had a newspaper, the Gawler Bunyip, which had been running for three years, but the Times was a penny cheaper (at two pence per issue) living up to its claim to be the 'cheapest provincial paper in South Australia.' The editors claimed, "... we are not activated by a spirit of rivalry, but by a desire to provide the intelligent inhabitants of the second town in the colony with a better class of local periodical literature than they have hitherto possessed." (5 March 1869, p. 2) Despite periodic reports of fresh discoveries, the gold deposits were exhausted by 1872 and news from the diggings became infrequent. 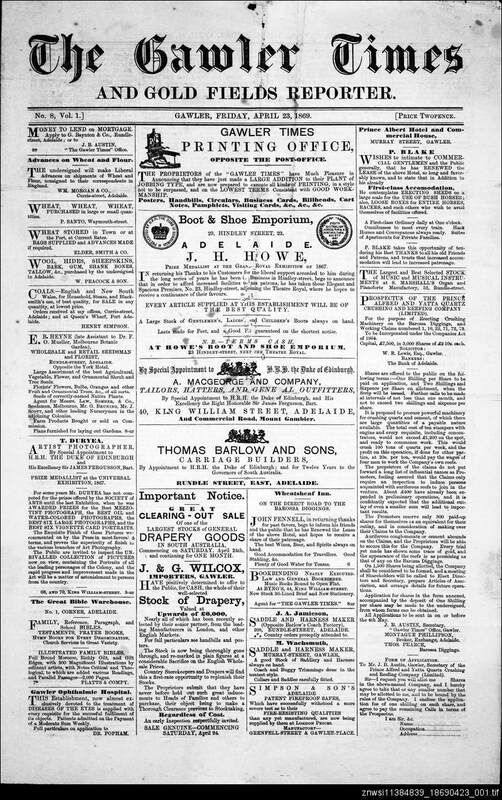 In June 1873, the Gawler Times reported to its subscribers that the newspaper had been sold to William Barnet of the Bunyip and it ceased to exist.